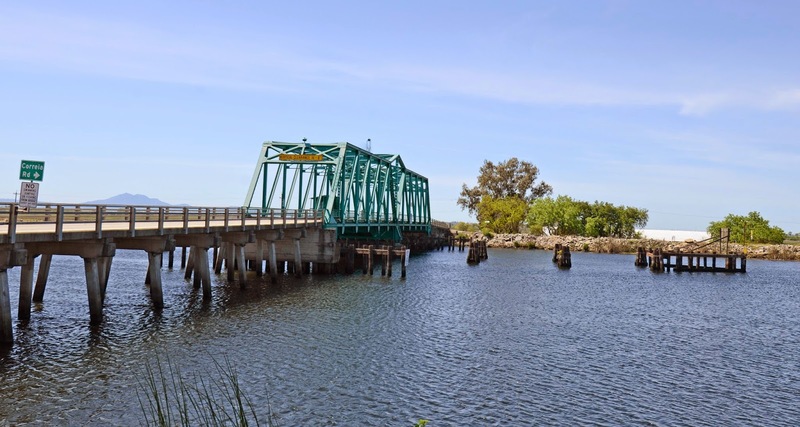 The California Delta was originally a swamp that was dredged during the 19th century to create arable land. Continual dredging and a system of levees are required to maintain these islands. Travel between them is made possible by about 100 bridges (see map below). The land is below sea-level and expensive to maintain, which may explain the current fight between residents and the state government over the proposed Bay Delta Conservation Plan. The Eight Mile Road Bridge (29C0219) is a 480 ft long reinforced concrete slab on precast pile extensions with a 204 ft long swing bridge over Honker Cut. It was built in 1936 and rehabilitated in 1975. 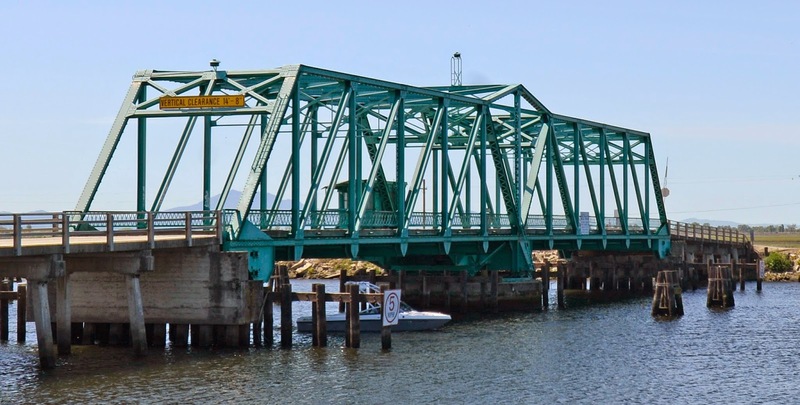 The rehabilitation probably didn't include a widening because the bridge is only 20 ft wide (and with 14.7 ft vertical clearance for trucks and 7 ft vertical clearance for boats). Eight Mile Road continues to the west for two miles before ending at Little Potato Slough. A cable ferry carries vehicles across the slough onto Venice Island. Movable bridges and cable ferries are similar, since they both use a mechanical device to allow boats and vehicles to co-exist. I've noticed that some of these ferries even have bridge numbers! San Joaquin County, California Bridges: Eight Mile Road Bridge across Honker Cut by Mark Yashinsky is licensed under a Creative Commons Attribution-NonCommercial-NoDerivatives 4.0 International License.